Published: Nov. 1, 2012 at 12:56 p.m. Updated: Nov. 2, 2012 at 02:30 p.m.
PITTSBURGH -- It was the last time the Pittsburgh Steelers met before heading off for their summer break. Coach Mike Tomlin called his charges together, dispensed his usual last thoughts and then slapped Jonathan Dwyer's picture up on the big screen in the meeting room. Calling out the about-to-be third-year running back's name, with every one of the Steelers players listening, Tomlin said this: show up to training camp overweight and you're fired. "That's Coach Tomlin," receiver Jerricho Cotchery said, with a head shake and chuckle both. "It was good how he did it," running back Isaac Redman said. 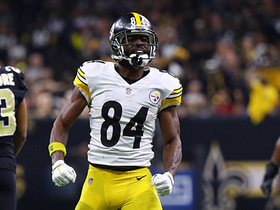 For the first time since 2008, the Steelers have a runner who's put together back-to-back 100-yard games. That runner is Jonathan Dwyer. 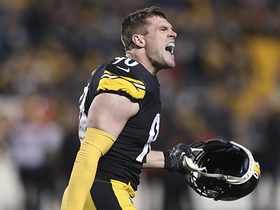 With a powerful gait, a no-nonsense style and a wonderfully warm smile, Dwyer is a renewed man -- and he's revitalized the Steelers' moribund run game. Every snap Dwyer gets in the 4-3 Steelers' measure-up matchup with the defending Super Bowl champion New York Giants on Sunday will be a reminder of why the team so loved him as a prospect out of Georgia Tech. Dwyer has neither hesitation nor qualm in discussing that day, four months ago, when Tomlin so publicly singled him out. There was no intent to embarrass, Dwyer said, and there was no real surprise, either. "I already knew what he was saying," Dwyer said, acknowledging that the words had come before and often. Extremely talented and productive in college, Dwyer was dogged by weight issues after arriving in Pittsburgh as a sixth-round pick in the 2010 NFL Draft. In turn, his coaches questioned his commitment. At that team meeting, Dwyer said, "I already was where I needed to be then, but (Tomlin) addressed it, in case. It was a challenge to prove him wrong and prove to everybody else I could do it." This is Tomlin's style. He says exactly what he's thinking and, as Cotchery explained, "everyone knows exactly where they stand. He's honest, he tells you how it is and you don't have to guess with him." Dwyer said it was never laziness or a lackadaisical work ethic that kept him mired in irrelevancy. There was a transition in going from college starter and star to NFL role player, behind a dynamic former first-round pick in Rashard Mendenhall. "It's going from always being the guy to then having to sit down and learn. It hurts you a little bit," he said. "I was turning away from people trying to help me and just being upset about the whole situation instead of doing something about it. 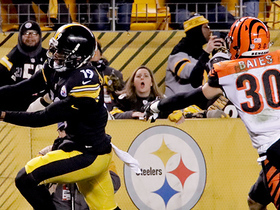 But after getting a little taste of playing last year, I wanted more." He worked at it, and Tomlin wasn't going to let him stop. Redman and center Maurkice Pouncey both said there was never any question Dwyer would come in at or under the Tomlin-specified weight. Redman said he saw a maturity in him. Pouncey said he saw a brain in him. "All that money and opportunity? You'd be stupid if you didn't," Pouncey said, laughing loudly. Dwyer is well-liked and definitely rooted for. He talks about earning the respect of his teammates; Redman said he's had it. "He is great to have in the meeting rooms. He's so focused, on and off the field," he said. Dwyer has gotten his chance these last two weeks in large part because both Mendenhall and Redman have been sidelined by injuries. On Wednesday, Mendenhall returned to practice and did individual drills with the backs. Redman, who had been the No. 2 back ahead of Dwyer, has been participating in practice since Friday. Originally from Camden, N.J., Redman said he'll definitely be playing up the New Jersey Turnpike on Sunday. He also said no one has told him or Dwyer or anyone how the carries will be divided -- or who will get the first one. There is no official Steelers policy that a player cannot lose his job while injured. But Dwyer said that should be the rule, no matter how well he's personally playing. "Rashard's been here, he's earned the starting job, he's played well, he's had great years here, he's the starter and that's it," Dwyer said, adding that Mendenhall, whom he called "the head honcho," hasn't done anything to lose his job. Dwyer said his role is "to complement Rashard." Dwyer himself was kept out of Wednesday's practice by a strained quad, though he expected to be back on the field Thursday and playing in some way Sunday. Whatever happens, Dwyer won't take anything for granted. 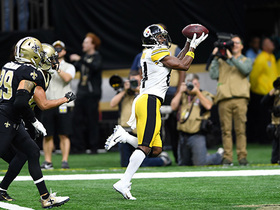 Just two games ago, when the Steelers lost to the Tennessee Titans, Dwyer was inactive, as he was the game before, against the Philadelphia Eagles. He had fumbled a ball late against the Oakland Raiders in Week 3, and so he was sent to the bench. That he didn't try to prove everything in his first carry back is a testament to how much he's grown. "I just believed in myself. And I knew I'd had these moments before. In high school, I was a skinny little freshman, a guy went down, I had one game to get my chance and the rest is history. It was the same thing in college. Guys went down, I became a starter for that game, and the next game, they believed in me," he said. Just as the Steelers do now.